"Paint is effectively a colored glue. Thus, a paint's job is to turn from a liquid into a solid and then stay in place permanently. Different paints achieve this in different ways. Watercolor paint does it by drying, releasing water into the air through evaporation and leaving only the pigments on the page. Oil paint is made of oils -- usually poppy, nut, or linseed oils. It doesn't dry. Instead, it has another trick up its sleeve: it reacts with oxygen in the air. Normally, this type of reaction is to be avoided, because oxidation turns butter and cook­ing oils, for example, rancid and bitter-tasting. But in the case of oil paint it is an advantage. Oils are composed of long hydrocar­bon-chain molecules. The oxygen grabs a carbon atom from one chain and joins it to another through a reaction, in the process opening that molecule to further reactions. In other words, oxygen acts as a hardener (just as water acts as a hardener in superglue) -- and yes, this is yet another polymerization reaction. 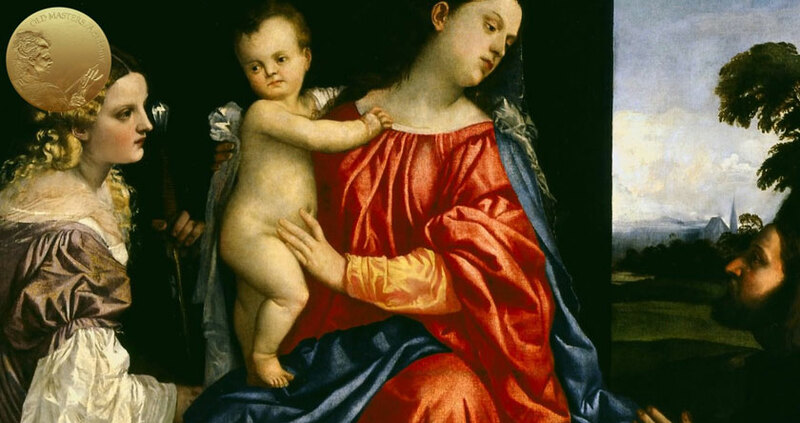 Click image to read more about Titian's technique. "This reaction is extremely useful because it produces a hard, wa­terproof finish of plastic on the canvas (oil painting could more accurately be referred to as plastic painting); it's incredibly resilient and holds up very well with age. The polymerization takes time, though, since oxygen has to diffuse through the top, hard layers of paint before it can get to the unreacted oil underneath. This is the downside of oil paint -- you have to wait a long time for it to harden. But the great masters of oil painting, like Van Eyck, Ver­meer, and Titian, used this to their advantage. They overlaid many thin layers of oil paint, which one by one chemically reacted with oxygen and hardened, building up a number of layers of semi­transparent plastic, one on top of another, a complex encasing of many differently colored pigments. "Layering paint gradually like this allows the artist to create wonderfully nuanced work because when the light hits the can­vas, it doesn't just bounce off the top layer -- some of it penetrates through to the layers below, interacting with the pigments deep in the painting and rebounding as colored light. Or, alternatively, it is fully absorbed by the different layers and thus produces deep blacks. It's a sophisticated way of controlling color, luminosity, and texture, which is exactly why the Renaissance artists adopted oil paint. Analysis of Titian's painting Resurrection reveals nine layers of oil paint, all working to create complex visual effects. It's exactly the intricate expressiveness of oil paint that made Renaissance art so sensual and passionate. The effect of layering is so powerful that it has transcended its roots in painting with oils and is now in­corporated into all professional digital illustration tools. If you use Photoshop, or Illustrator, or any other computer graphics tools, you'll be making images in layers. "Linseed oil is also used for many applications beyond oil paint, such as treating wood, to create a transparent, protective plastic barrier -- just as oil paint does, but this time, without color. Cricket bats are just one of many wooden objects traditionally given an outer coating using linseed oil. You can also go whole hog and use linseed oil to make a solid material called linoleum, again through a polymerization reaction. Linoleum, a plastic, has been used by designers and interior decorators as a waterproof floor covering. Artists use linoleum too. They carve images into it just as they do with woodcuts, to create prints. Here again, layers are the primary way of building up complexity in the final work."